With the mortgage and real estate markets working through a downturn, competition for Notary signing agent assignments has become fierce. Complicating the situation, many mortgage companies are merging or reorganizing, so mobile Notaries often discover that the people who used to give them assignments are no longer around. But amid all the changes, a growing number of nationwide signing services and title companies are using SigningAgent.com to find qualified NSAs. As a result, SigningAgent.com is becoming a valuable resource for NSAs. Simple updates to your profile can help bring in more business, while assuring companies that hire you that they’ve hired a certified, competent, and well-qualified Notary. To take full advantage of the directory, make sure your listing is current and fully updated using the site’s newest available features. Why Get Listed On SigningAgent.com? Increased Marketability: Your SigningAgent.com profile is automatically made available to a wide variety of companies (see list at bottom), many of which regularly download lists from the website when searching for qualified local Notaries. The more information your directory listing contains — such as qualifications, coverage area, availability, and contact information — the more likely it is that your name will appear in their search results. Increased Consumer Protection: For safety and security reasons, signers often want to know about the Notary who will be showing up at their door. Being able to access a detailed profile, including a photograph, background check information, and other relevant credentials, gives signers an added layer of protection and peace of mind. Assured Credentials: Title companies and signing services use SigningAgent.com because they know that all of the listed signing agents are NNA certified and have undergone proper background checks. The SigningAgent.com directory now gives you the ability to upload a photograph and include links to your Notary commission certificate and proof of E&O insurance coverage. The site has also been enhanced with mobile Internet capabilities. If you are currently an NNA Certified Signing Agent, you can update your SigningAgent.com profile through the NNA website. 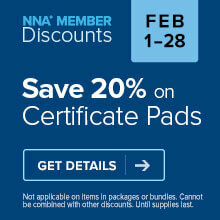 Simply log in to your NNA profile using your email address and password. From the “My NNA” page, select “My Signing Agent Profile” from the left menu. Click on “edit” in any of the sections to opt in to be listed in the SigningAgent.com Directory or update your information. 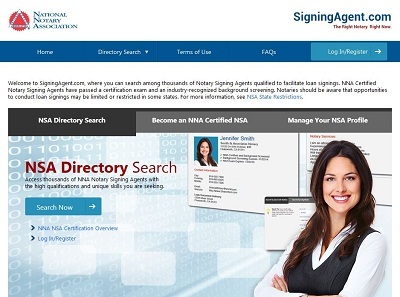 NNA Certified Signing Agents automatically receive a directory listing on SigningAgent.com. To find out more about becoming an NNA Certified Signing Agent, contact our Customer Care Team at 1 (800) US NOTARY (1-800-876-6827). The information on "To Get a Leg Up on the Competion was blocked could you please send me this info, as I am interested in during this type of work. Hi Joyce. We're sorry you had problems viewing the article. If you could please email us at social@nationalnotary.org and let us know what type of device you were trying to read the article on, and describe how the article is being blocked, we'll see if we can resolve the issue for you. This is some of the best advice I have seen from the NNA. Thank you. Thank you...ALL EXCELLENT IDEAS.~ WHEN I WENT TO MY FIRST SIGNING AGENT job ...I was professional with what credentials I had proof to the party is was who they were expecting I shared my driver's license as well as my NEW YORK STATE SERVANTS ISSUED DOCUMENT. WITH THIS BEING SAID I HAVE ALSO FINISHED MY NATIONAL NOTARY ASSOCIATION SIGNING AGENT CREDENTIALS...CAN YOU ALSO GIVE TO YOUR STUDENTS CARRYING PROOF?